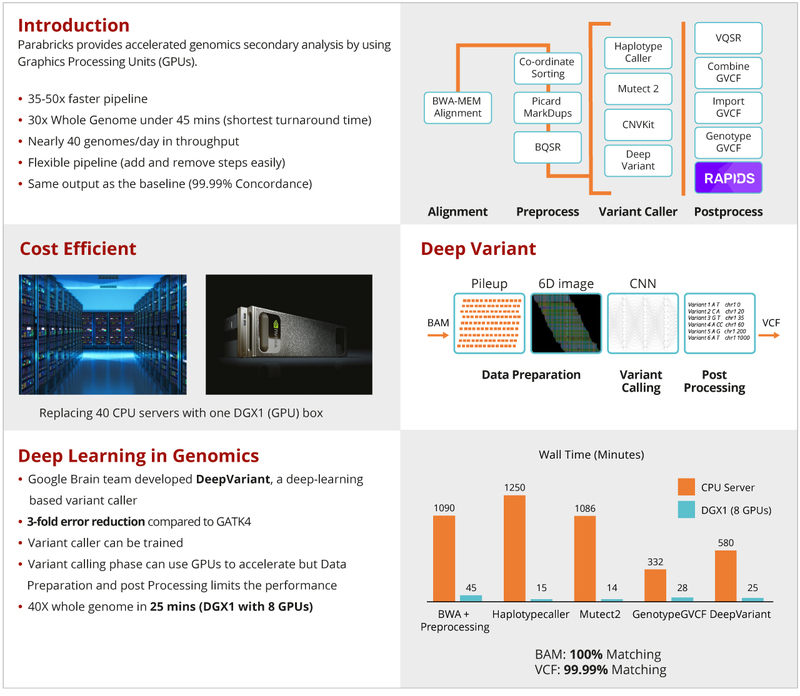 XENON is working with Parabricks a highly innovative company that provides high-performance genomic analysis that can analyze whole human genome under an hour compared to days. Using state-of-the-art GPU acceleration and machine learning, users can significantly increase the throughput of their centers. By using GPU accelerated computing, the Parabricks solution can provide the throughput comparable to nearly 40-50 CPU servers with one GPU server, thereby reducing IT management overhead, and operating costs (including power and cooling). Whether it’s analysis or re-analysis of NGS data, Parabricks is rapidly evolving as a preferred solution which provides current pipelines, vast improvements in efficiency while enabling user-driven customization. For users on the cloud, computing costs are proportional to execution time and, by reducing runtime by a factor of 30-50, Parabricks reduces total computing costs by up to 50% compared to CPU-only solutions. The output BAM file after Alignment, Sorting, Marking Duplicates, and Apply BQSR Stage is identical to the baseline. The baseline variant caller in GATK 4 is non-deterministic and can generate slightly different results based on certain parameters. For this step, the result generated by Parabricks software is within 99.999% of the GATK 4 execution. The differences are comparable to the variation in GATK execution due to multiple threads and nodes. Parabricks’ software is available on a wide variety of platforms. It has been rigorously tested on NVIDIA, HPE, Dell, and IBM servers. This solution provides excellent performance on cloud platforms, such as Microsoft Azure, Google Cloud, and Amazon Web Services as well. Parabricks’ software is available on a wide variety of platforms. It has been rigorously tested on NVIDIA DGX platform, which is available from XENON. Parabricks software provides 30-50x times faster analysis and higher throughput at half of the computing cost while generating equivalent results. Limited free trials are available on; on-premise servers, AWS, Google Cloud and Microsoft Azure. Contact info@xenon.com.au for a demo or more information. 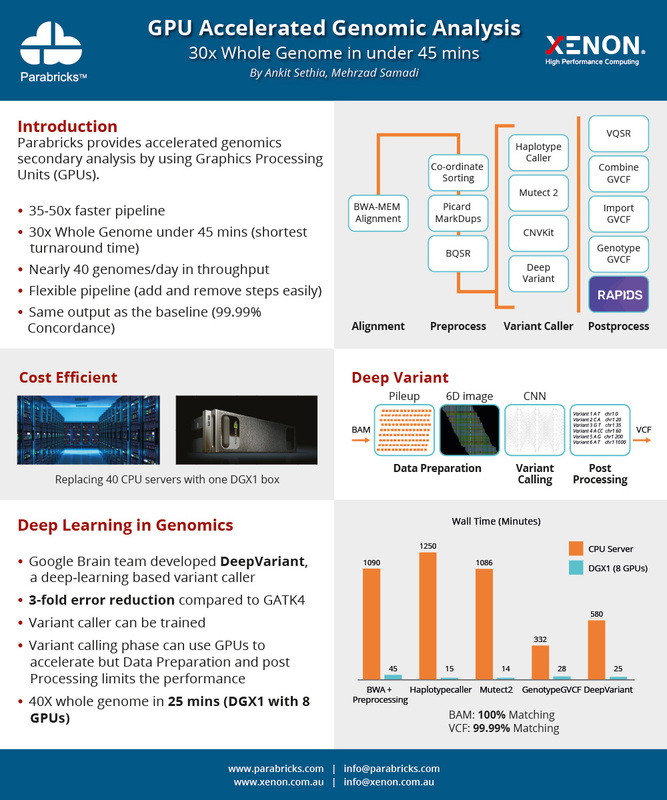 Download the Parabrick Poster Presentation. For more information, contact info@xenon.com.au.